Most of you guys have young children that provide you with all the material you need for scrapping. I have Grady. He's my favorite subject! This one took some time, but it looks great, huh? So much stuff going on in this one . 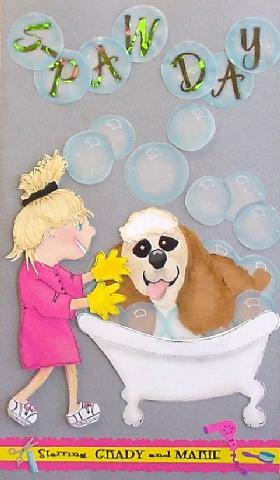 . . stick people made to look like Marie, I made Grady sitting in the tub on the front, bubbles are vellum with chalked edges and reflections, there are stickers everywhere, and the scissors/hairdryer/comb all were dye-cuts that I got from my lss. I made a small pocket for the lock of Grady's hair on the last page. How lucky I was that Marie wears the hot pink smock and yellow gloves when she's grooming her customers . . . the colors make this whole layout happy and fun to look at!